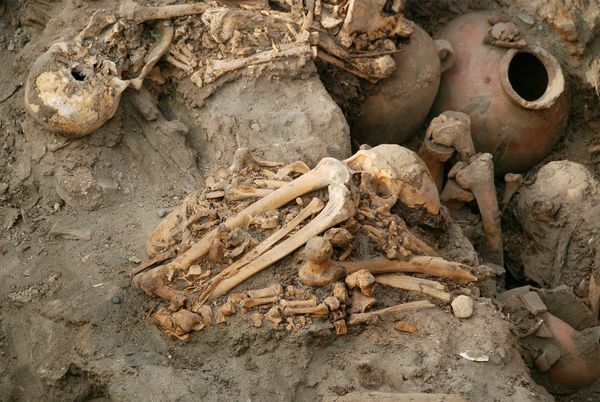 Arranged in the fetal position, this skeleton is among some 80 bodies discovered this spring in a vast Peruvian tomb—the largest yet found at the ancient site of Pachacamac. Buried a thousand years ago with wooden "false heads," the now decayed mummies were unearthed within a perimeter of infant human remains. Once covered by a thatch roof, the tomb may have been a final resting place for diseased pilgrims drawn by promises of miracle cures, reports a team led by archaeologist Peter Eeckhout of Université libre de Bruxelles in Belgium. As for the babies, Eeckhout doesn't rule out that they may have been sacrificed. It's just one more riddle of the Ychsma (pronounced EESH-MA)—the little-understood pre-Inca people who built their largest known city at Pachacamac, he said. 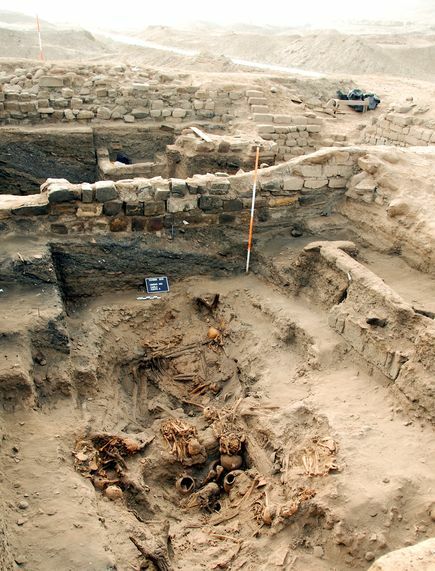 Skeletons and ceramic grave goods emerge from the newfound burial site at Pachacamac, not far from Lima. The oblong chamber was dug into the ground and covered with a roof of reeds, which was supported by tree trunks, according to the study team. Apparently overlooked by 16th-century Spanish conquistadors and subsequent grave looters, the tomb contains fabric traces that suggest the dead had been traditionally mummified. 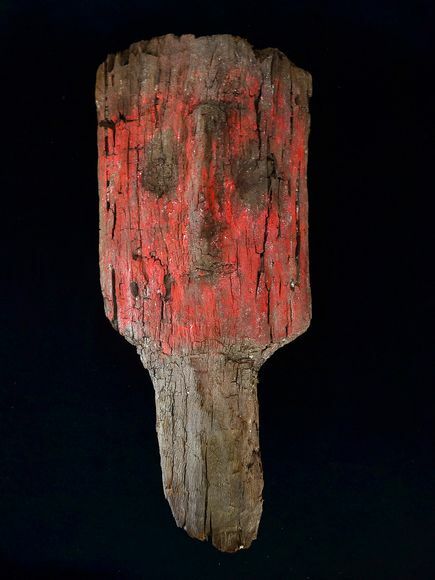 Wooden "false heads"—including this one found in the new tomb—are trademarks of the Ychsma. The five false heads in the newfound tomb didn't cover the faces of the deceased but were placed on or wedged into their curled-up mummies. The artifacts "likely served to bestow an identity or persona to the [mummy] bundle and to aid in that individual's passage to the afterlife," University of Illinois anthropologist Matthew Piscitelli said via email. 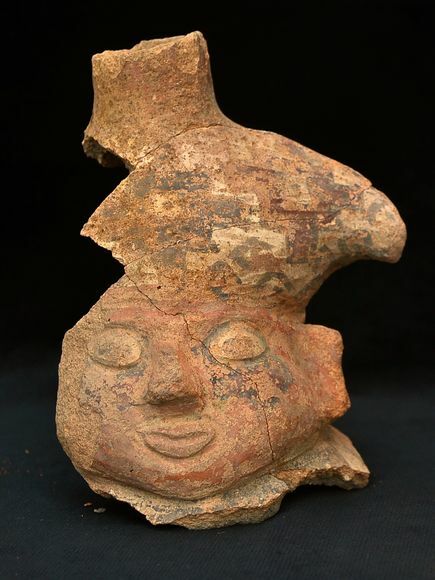 Another face, this one in clay, stares out from a broken ceramic head excavated from the newfound Pachacamac tomb. An important religious and pilgrimage center for nearly two millennia, Pachacamac "housed a powerful oracle, and several ancient groups constructed sacred structures and buried their dead among its many temples and cemeteries," said the University of Illinois's Piscitelli, who wasn't involved in the recent excavation and is also a National Geographic grantee. The adult dead in the newfound tomb were found in the fetal position, which may have represented "some kind of rebirth" to the Ychsma, excavation leader Eeckhout said. About half the bodies in the tomb belonged to babies—signaling either ritual sacrifice or that they'd "died from natural causes and then were deposited in some place until the moment of the foundation of that tomb," Eeckhout said. Physical evidence of sacrifice, he added, may be hard to spot on the tiny corpses, particularly in cases of suffocation. 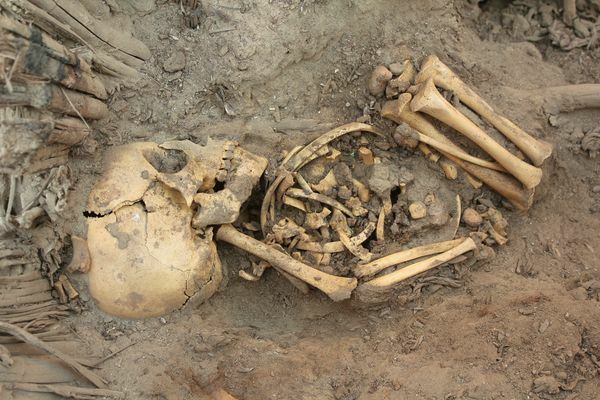 Signs of sacrifice have been found in the past on very well preserved Pachacamac infant remains, he added. "But in this case it is absolutely not sure." There's no doubt, though, that animals were sacrificed, Eeckhout said. Guinea pigs appear to have been the favored offerings, but dogs and parts of llamas or alpacas have also been recovered from the tomb.